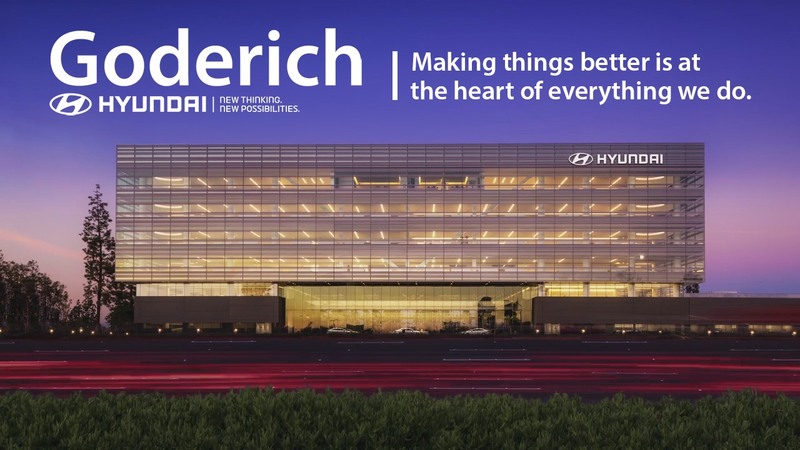 Hyundai of Goderich | Why Hyundai? In the pursuit of creating vehicles of unparalleled quality and workmanship, we have one aim: To make everything better. It's how we can back our vehicles with America's Best Warranty. The results include third-party awards for the highest customer loyalty and lowest cost of ownership. But the thing about better is there's no finish line, because everything can always be better. Creating a better driving experience is a result of many factors. Not only how a car performs on the road, but also how you and the vehicle interact with each other and how it makes you feel physically and emotionally. Technological innovations we engineer into every Hyundai help us achieve all these criteria, whether that means improved fuel economy, advanced connectivity, safety, or comfort and convenience. There's nothing more important to you than keeping your loved ones safe, so there's nothing more important to us. Which is why creating a better suite of safety features that pushes the envelope of technology and innovation was a top priority. For our efforts, we were recognized for outstanding safety by the Insurance Institute for Highway Safety in 2016. A large part of creating anything better is thinking ahead, and when you take a look at our concept cars you realize just how incredibly far ahead we're thinking. These vehicles are our opportunity to dream, explore and stretch our imaginations, designing the next generation of Hyundai that's as exciting and unpredictable as the future itself. Do you have questions left unanswered? Ask us!